Mr. Lincoln was “as brave a man as ever lived,” said longtime friend William Greene.1 Mr. Lincoln backed up his friendship with sheer physical courage. A story from the Black Hawk War cemented Mr. Lincoln’s reputation for bravery. His company came across an old Indian who the soldiers wanted to kill. “Mr. 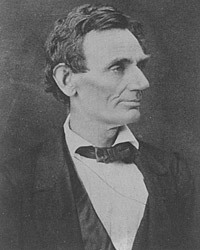 Lincoln in the goodness & kindness and humanity & justice of his nature stood – got between the Indian and the outraged men – saying – ‘Men this must not be done – he must not be shot and killed by us,” reported New Salem friend William G. Greene. Although some of their friends charged that the Indian was a spy, “Still Lincoln stood between the Indian & the vengeance of the outraged soldiers – brave, good & true. Some of the men said to Mr Lincoln – ‘This is cowardly on your part Lincoln. '” Rising to his full height, Mr. Lincoln challenged any man who thought he was a coward to test that conviction. Abraham Lincoln Papers at the Library of Congress. Transcribed and Annotated by the Lincoln Studies Center, Knox College. Galesburg, Illinois. (James Q. Howard, Biographical Notes, May 1860). Douglas L. Wilson and Rodney O. Davis, editor, Herndon’s Informants, p. 18-19 (William H. Herndon interview with William G. Greene, May 30, 1865). Gabor S. Boritt, editor, The Lincoln Enigma, p. 26 (Douglas L. Wilson). Gabor S. Boritt, editor, The Lincoln Enigma, p. 59 (Gerald J. Prokopowicz). Francis Fisher Browne, The Every-day Life of Abraham Lincoln, p. 176-177. William H. Herndon and Jesse W. Weik, Herndon’s Life of Abraham Lincoln, p. 85-86. Joseph G. Holland, Life of Abraham Lincoln, p. 96-97. Francis Fisher Browne, The Every-day Life of Abraham Lincoln, p. 175-176. Douglas L. Wilson and Rodney O. Davis, editor, Herndon’s Informants, p. 203 (Letter from Robert L. Wilson to William H. Herndon, February 10, 1866). Usher Linder, Reminiscences of the Early Bench and Bar of Illinois, p. 66-67. Alonzo Rothschild, Lincoln, Master of Men: A Study in Character, p. 74. Michael Burlingame, editor, Noah Brooks, Lincoln Observed: The Civil War Dispatches of Noah Brooks, p. 205 (from Noah Brooks, “Personal Recollections of Abraham Lincoln” first published in The Harper’s Monthly Magazine, May 1865).